It all started back in May when we were approached by a popular teachers' resource website "Teachit". In June "Teachit" were to hold a competition for the many thousands of teachers subscribing to their site and they were seeking a suitable prize for the winner. We had the honour of being approached in May and asked if we would like to give a performance to the winning school as the prize. Naturally, we were delighted to have been asked and immediately agreed. In July we learnt the winner was St. Mary's Primary School in Haddington, East Lothian. 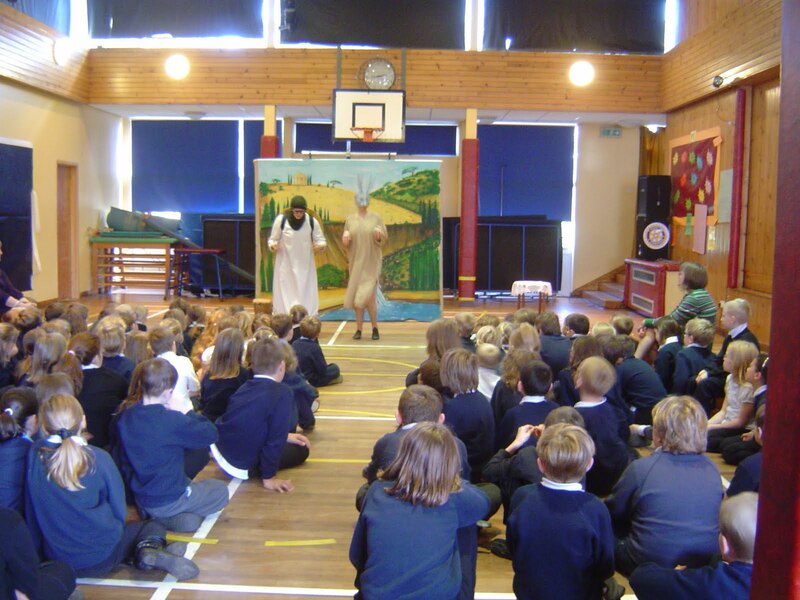 We made contact and packed our bags for a performance of "The Story of Aesop's Fables" on Monday 4th October, travelling up on the Sunday and staying overnight at The Toll Bidge Hotel in Haddington. The Toll Bridge made us most welcome and we spent a really enjoyable night there feasting on their magnificent locally caught haddock for supper and a scrumptious Scottish breakfast before departing for the school ten minutes away. The performance was very well received and the Head Teacher wrote thanking us. p.s. I must learn to speak the language!